St Chad's Roman Catholic Cathedral, Queensway (Inner Ring Road dual carriageway), Birmingham, by A. W. N. Pugin (1812-1852) with George Myers (1803-1875) as builder. 1837-41. 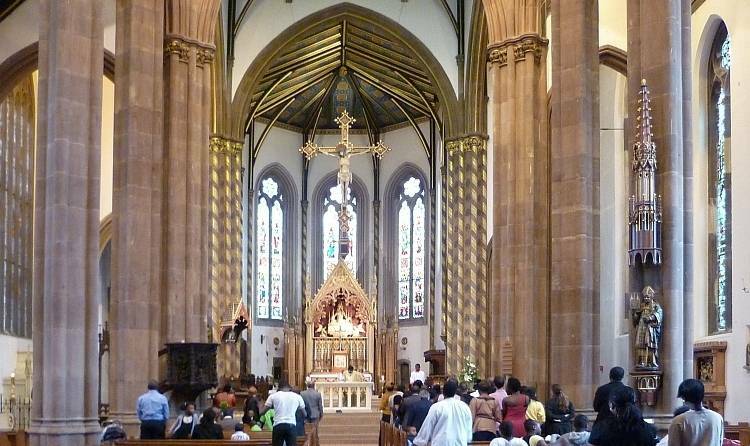 The interior is seen here at the start of a particularly joyous Mass for French-speaking members of the community. Overlooking the congregation on the right is a sixteenth-century oak statue of St Chad holding a model of Lichfield Cathedral, where this "Apostle of the Midlands" established his see in the seventh century. In terms of its continued outreach and vibrancy, as well as of its historic significance in the Catholic Revival, St Chad's is one of Pugin's most important works. It also marks a major advance in the architect's own career. John Betjeman was less than complimentary about the exterior, describing it as "not much to look at." But the interior was quite another matter: "inside it fairly takes the breath away," he wrote: "it soars to the heavens; its long thin pillars are like being in a mighty forest. The roof is a bit flimsy-looking, but the flimsiness is redeemed by the brilliant colours. The stained glass glows like jewels; the great rood screen in front of the altar adds mystery to what would otherwise be rather an obvious place; the altars blaze with gilding and colour" (qtd. in Doolan 1). Not everyone would agree that the roof looks "flimsy": Andy Foster, for instance, admires the "daringly thin timbers," suggesting that "anything heavier would overwhelm the arcades" which he describes as "exceptionally tall and delicate" (49). But most would find the rest of Betjeman's comment perfectly accurate — except for the mention of the rood screen, which was removed in 1967 in the interests of accessibility and openness (see final discussion). Left: The chancel. Right: Looking towards the west entrance. Worth noting in the left-hand picture (when enlarged) is the statue just glimpsed on the extreme left. A fifteenth-century oak figure of the Virgin Mary from the Netherlands or perhaps Germany, which Pugin restored and gave to the cathedral in 1841, it was probably the very first such statue to have been "erected for public veneration in England after the Reformation" (Doolan 5). So, like the new cathedral itself, it marks a significant step forward for Catholicism in Britain. Foster describes the Virgin as looking "memorably enduring and serene" (51). 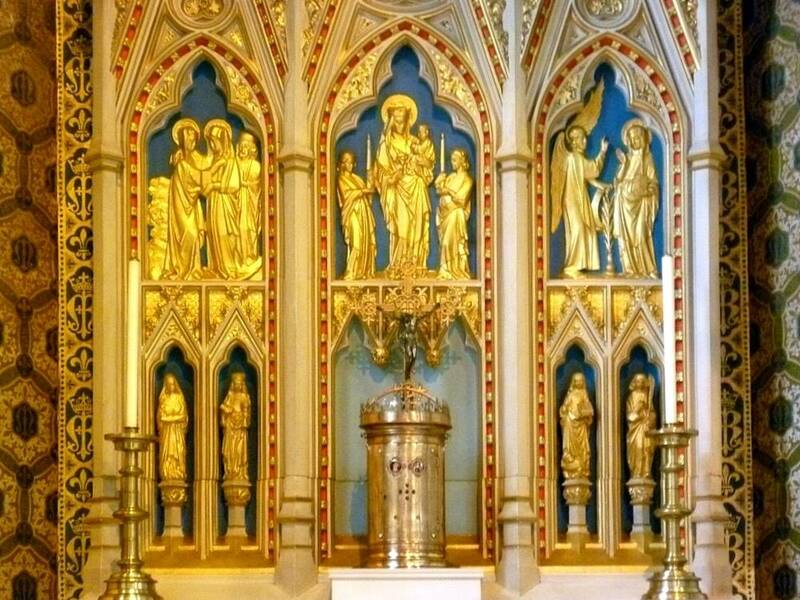 The statue stands under its canopy by the Lady Chapel, against the beautifully stencilled and scrolled pillars shown in close-up here. 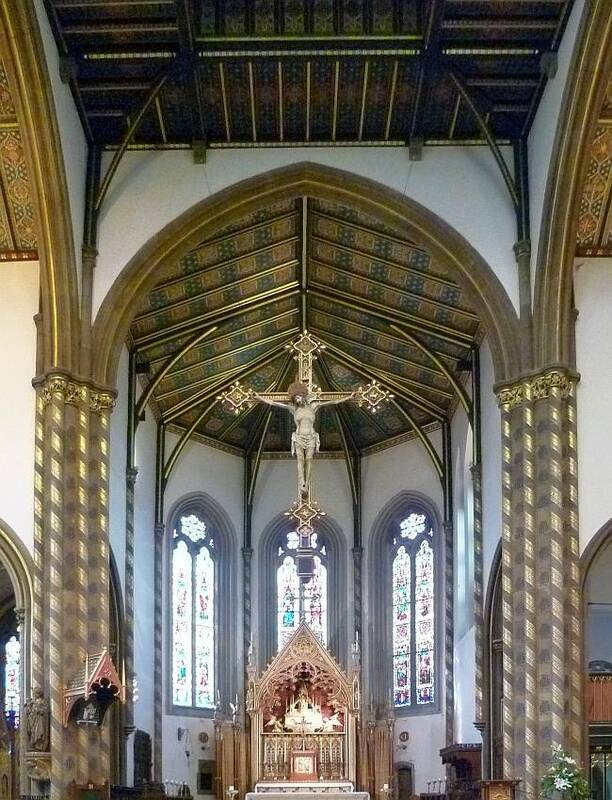 The archbishop's throne to its right, also of oak, was designed by Pugin, its canopy matching that over the altar, and rising to nearly 30' (Dent 467). Looking west from the chancel gives some idea of the spatial dimensions of the cathedral. The original organ was housed in a west gallery, which also accommodated the choir; but it was moved to the sacristy in 1854 (see Dent 464). The present organ was installed here only in the late twentieth century. Its splendid case works well with other elements in the cathedral. 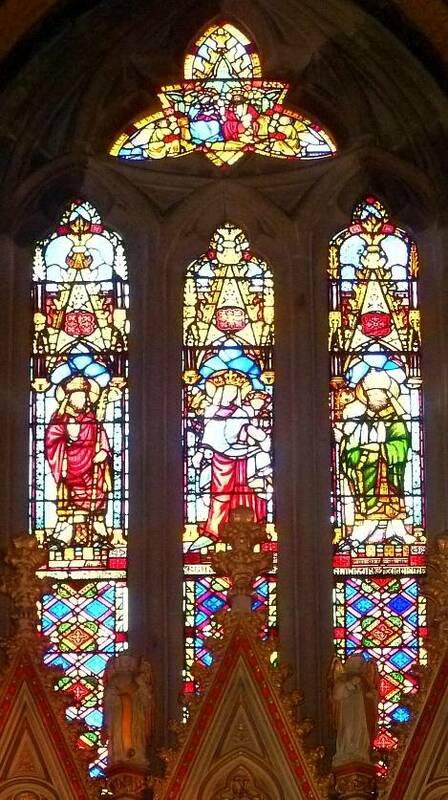 Left to right: (a) Stained glass window to the left of centre: here Pugin shows St John the Evangelist and St Peter, above St Michael and St Edmund. 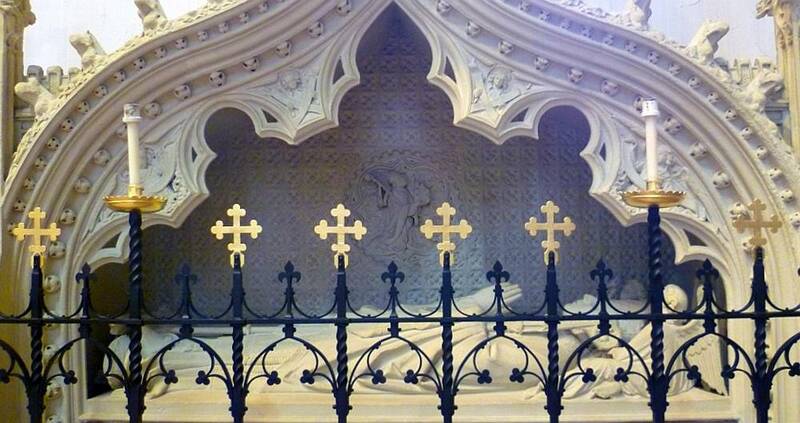 (b) Close-up of the altar of 1841, decorated at the top by Joseph Aloysius Pippet, Hardman's chief decorator. (c) Central east window, showing Mary holding the infant Jesus, beside St Chad with his mitre and red chasuble. All three east windows were the gift of the Earl of Shrewsbury: note the shields between the saints of the left-hand window, sporting the rampant heraldic lions of his family, cf. the lions on the west door of St Giles, Cheadle. The windows were executed for Pugin by William Warrington (Shepherd 356). The altar is described by Foster as an "important, early re-creation of medieval fittings, comparable with Pugin's thrones in the House of Lords" (51). 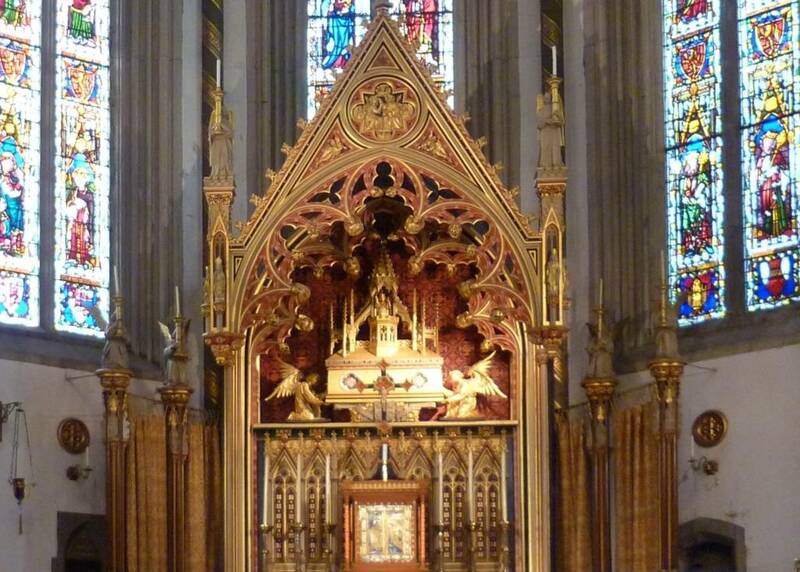 The finely-wrought casket on the altar was also designed by Pugin. It is a reliquary — a container for the relics of St Chad found under the altar of the chapel of Aston Hall, on the outskirts of Birmingham. Pugin was guided here by Bede's description of the original shrine for the relics at Lichfield Cathedral (see Fisher 29-30). Even the curtains either side of the altar were designed by Pugin (Doolan 6). Left: The Lady Chapel, with its screen, altar, elaborate reredos, cylindrical tabernacle and window all designed by Pugin. Right: Close-up of altar carving, showing the Presentation of Jesus in the Temple, the Nativity, and the Adoration of the Magi. The hounds in the nativity scene may be another reference to the Earl of Shrewsbury's family shield. Left: The reredos shows the Visitation, with Mary and her cousin Elizabeth, the Virgin Mary with the infant Jesus, and the Annunciation, with the Angel Gabriel. Below are four female saints: Mary Magdalene, St Barbara, St Cecilia and St Catherine. 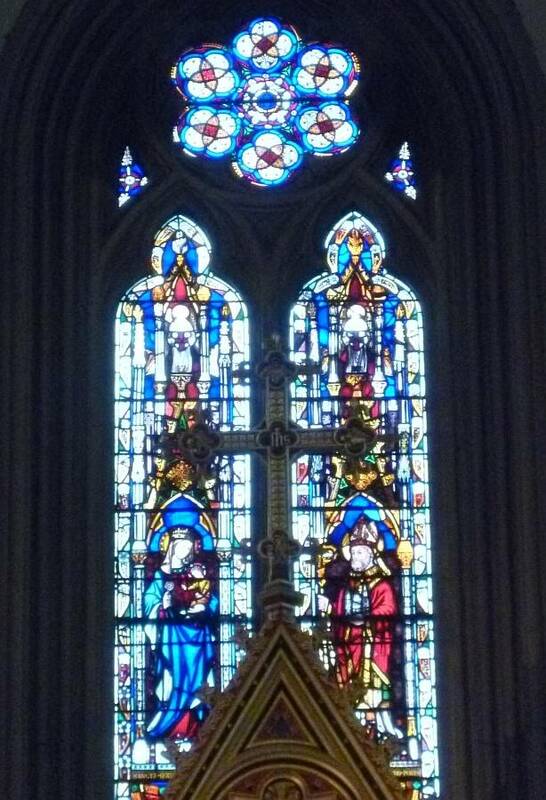 Right: The stained glass window at the back, partly obscured here, shows Mary with St Cuthbert and St. Chad. 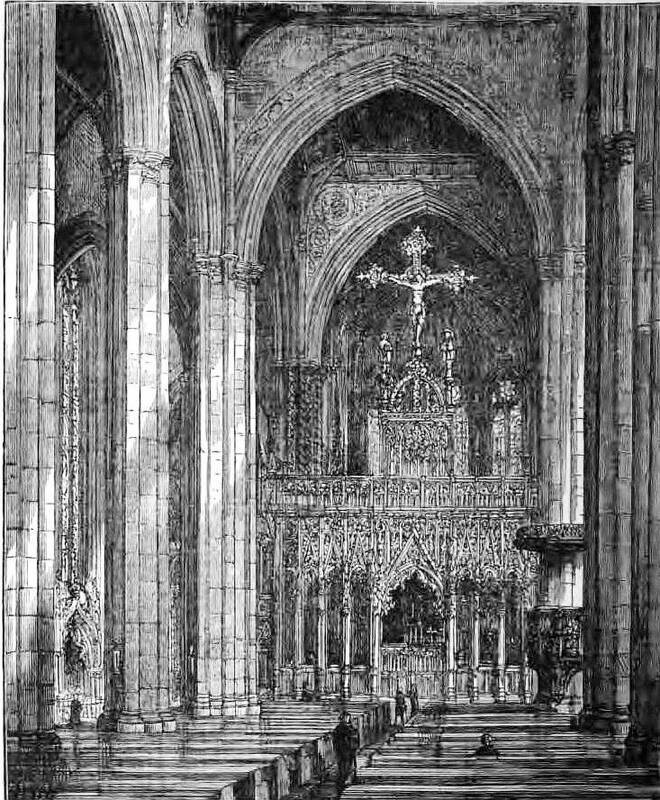 Pugin particularly mentions the tabernacle in the Lady Chapel when writing to A. N. Didron, editor of Annales Archéologiques, in January 1842, describing it as being "en forme de tour ornée de pierreries at de quatre évangélistes, en émail" (9). 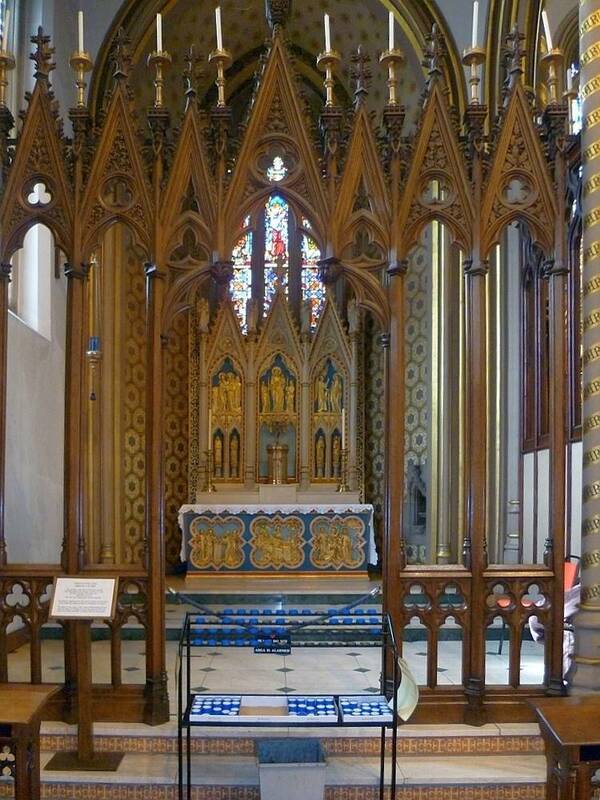 The Lady Chapel's screen too is elaborate, beautifully carved with a central quatrefoil, trefoils and pinnacled arches. This makes up a little for the loss of the cathedral's original rood screen. The walls are stencilled in patterns of blue and gold, with the initial "M" and fleur-de-lys patterning close to the altar. 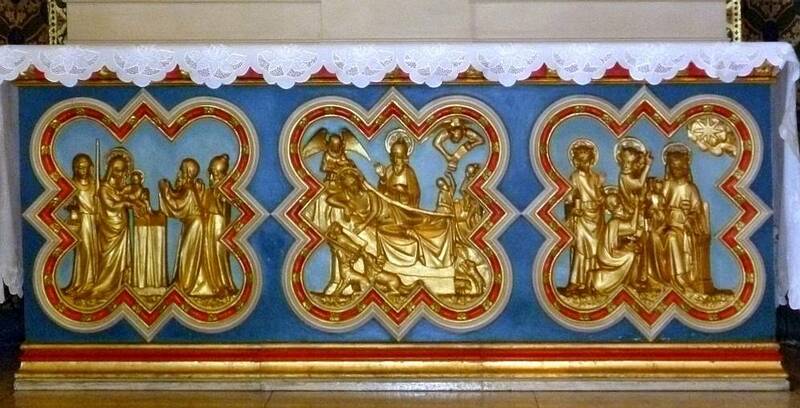 All in all, as Pugin himself remarks to Didron, the chapel is "extrêmement riche" (9). Left:The monument to Bishop Walsh in the north aisle, in Bath stone. Right: Closer view of the bishop's recumbent effigy. Bishop Walsh (1776-1849), shown here in "pontificals, with crozier and mitre" (Dent 465), was responsible for commissioning not only this cathedral but St Mary's College in nearby Oscott. He had taken a personal and paternal interest in the young architect, sometimes calling him "Bishop Pugin," and forbidding him to fast during Lent to preserve his health. He had once written to Shrewsbury, "I consider him to be an extraordinary genius raised up for these times" (qtd. in Hill 210). The design of the monument is widely attributed to Pugin, and its execution to George Myers, in 1850. The central roundel of its daipered backing sports a little figure of the bishop bearing a model of the cathedral. The monument was displayed in the Medieval Court at the Great Exhibition, where it attracted praise for being so finely carved and authentically medieval: "The effigy has a striking resemblance to those venerable and dignified effigies still remaining in our ancient churches" (The Crystal Palace, 215). Note that an early account credits the design of the monument to Pugin's eldest son, Edward Welby Pugin (see Dent 465). This seems likely in view of the latter's similar monuments to his own father at St Augustine's, Ramsgate (1853), and to Canon Richard North at Our Ladye Star of the Sea, Greenwich (1860). 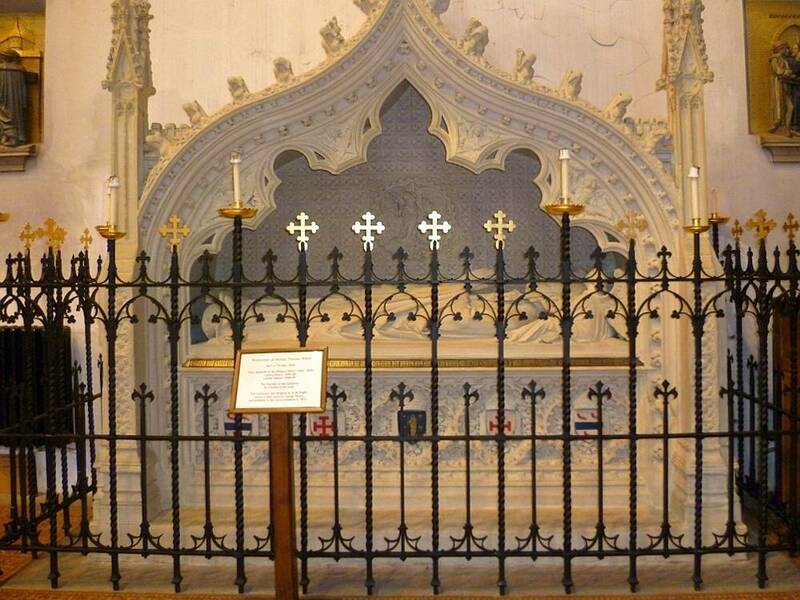 But it seems even more likely that Pugin himself would have been involved in paying this tribute to his old friend. The octagonal font, designed by Pugin, not elaborate but with four carvings representing the four Evangelists. The casket for the holy oils, behind it, was also designed by Pugin, as were the candle-holders and tiles, the latter made for Pugin by Minton & and Co. (see Doolan 3). 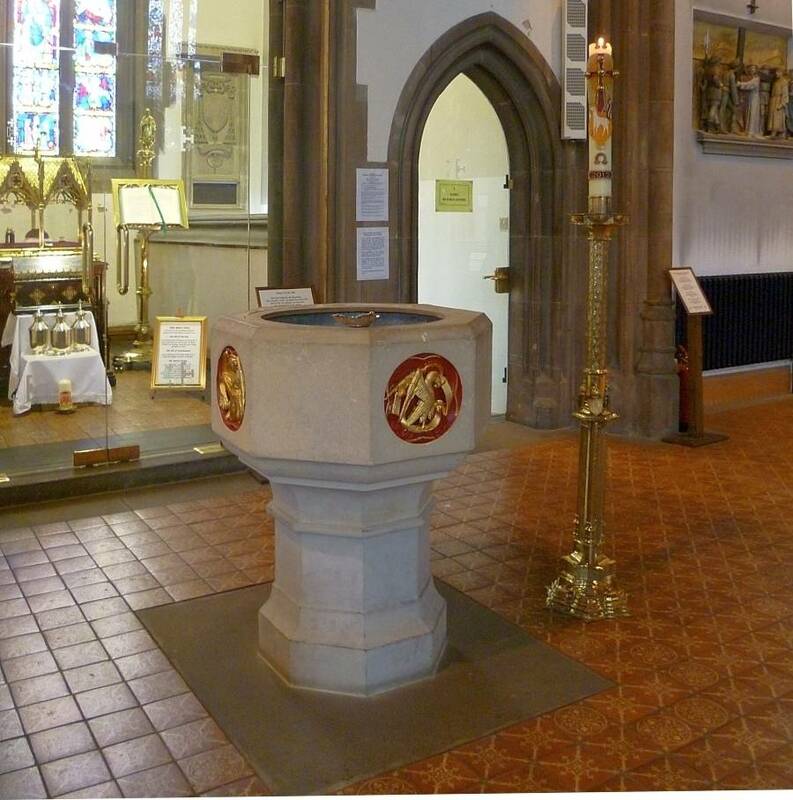 The candlestand by the font is similar to one of the large ones illustrated in the Crystal Palace catalogue (218), and is for the paschal candle at Easter. St Chad's makes its impact by bringing together many different elements. 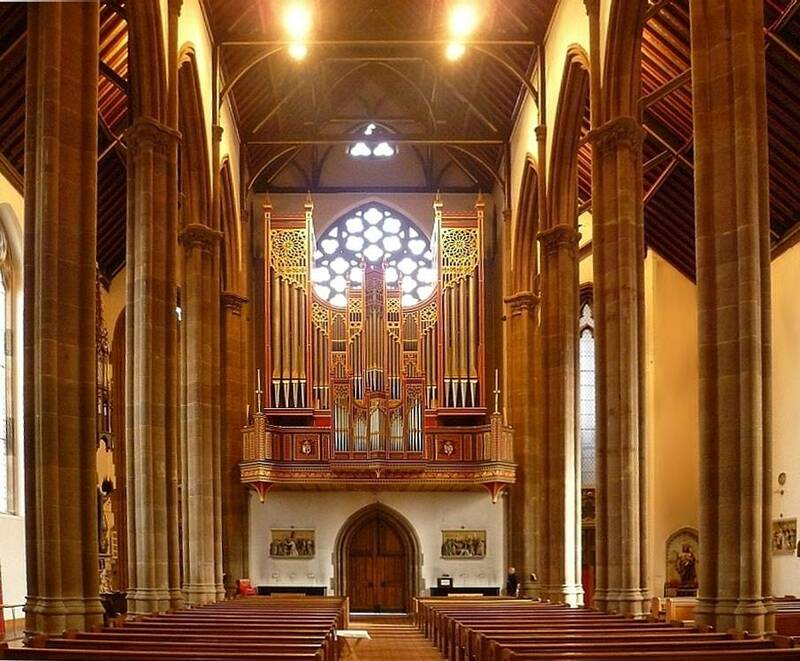 As at St Giles in Cheadle, Pugin has turned his hand to every aspect of the church and its fitments and furnishings, drawing on his scholarly research into medieval craftsmanship, and blending the subsequent designs into a new harmony. As well as recreating the past in his architecture and art, he has brought in the fruits of another related interest — collecting ecclesiastical antiquities. The statue of Mary by the Lady Chapel is just one example. Another important example is the fifteenth-century Flemish figure of Christ which Pugin affixed to the great crucifix on his rood screen, now suspended in front of the chancel. At last the time came, in June 1841, for the consecration. Partly because of the installation of the relics of St Chad, this grand affair, with Pugin as master of ceremonies, and Bishop Walsh officiating, lasted five days. The architect/designer had high hopes for his new cathedral: "see Birmingham is cramed [sic] full every sunday eving [sic] standing room & all," he wrote (qtd. in O'Donnell 21). And, as noted at the end of my discussion of the exterior, these hopes were largely fulfilled. 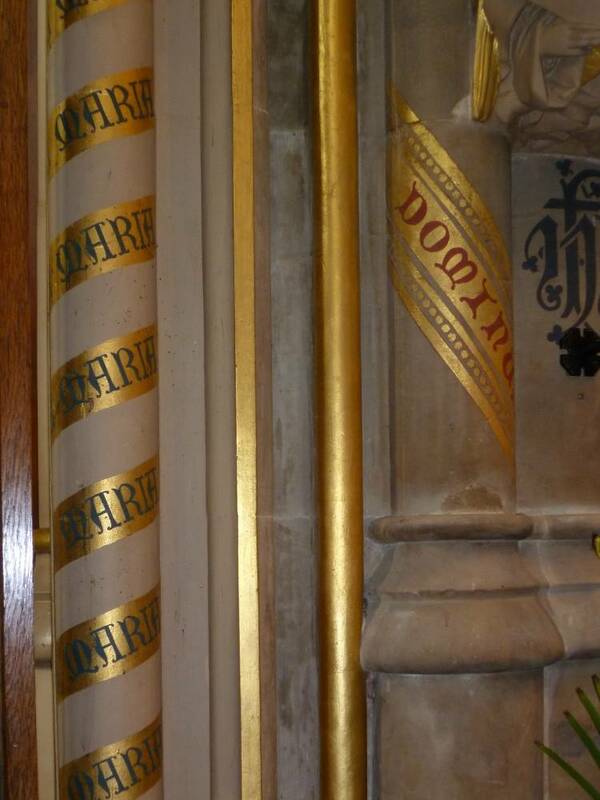 The cathedral before the rood screen was removed (from Dent 458): sublimity sacrificed to accessibility? The cathedral is not as Pugin had left it. Removing the rood screen has clearly made a huge difference. Ironically, this feature so beloved of Pugin is now at Holy Trinity, Reading — an Anglican church — a similar fate to that which befell the tabernacle of St Augustine's, which ended up in the Harvard chapel at the Anglican Southwark Cathedral. Surely Betjeman was right to have felt that it added "mystery" to what is now, instead, "rather an obvious place." Other items have also been lost. Indeed, the listing text says bleakly: "The furnishings now mostly gone." On the other hand, like older cathedrals, St Chad's has acquired new elements over the years, such as additional stained glass windows by John Hardman and his firm, and of course the whole of St Edward's Chapel, designed by Pugin's grandson, Sebastian Pugin Powell (1866-1949). Still, St Chad's continues to serve as a lasting testimony to the inspiration and versatile talent of one "extraordinary genius." [Offsite] "The Building of St Chad's Cathedral." Catholic Herald Archive. [Offsite] Navigate to a virtual tour of the crypt (the cathedral's own website). "Cathedral Church of St Chad, Birmingham." British Listed Buildings. Web. 20 January 2013. The Crystal Palace, and Its Contents. London: W. M. Clark, 1851. Internet Archive. Web. 20 January 2013. Dent, Robert Kirkup. Old and New Birmingham: A History of the Town and Its People. Birmingham: Houghton & Hammond, 1880. Internet Archive. Web. 20 January 2013. Doolan, Father Brian. The Metropolitan Cathedral and Basilica of St Chad Birmingham. 5th revised ed. Birmingham: St Chad's Publications, 2006. Available at the cathedral. Print. Fisher, Michael. "Gothic For Ever": A. W. N. Pugin, Lord Shrewsbury, and the Rebuilding of Catholic England. Reading: Spire, 2012. Print. Foster, Andy. Birmingham. Pevsner Architectural Guides. New Haven and London: Yale University Press, 2005. Print. Hill, Rosemary. God's Architect: Pugin and the Building of Romantic Britain. London: Penguin, 2007. Print. O'Donnell, Roderick. The Pugins and the Catholic Midlands. Leominster: Gracewing, and the Archdiocese of Birmingham, 2002. Print. Pugin, A. W. N. The Collected Letters of A. W. N. Pugin, Vol. 1. 1830-42. Ed. Margaret Belcher. Oxford: Oxford University Press, 2001. Print. Shepherd, Stanley A. The Stained Glass of A. W. N. Pugin. Reading: Spire Books, 2009. Print.